by Brianna Crandall — October 31, 2018 — Making the commitment to provide ready access to refreshing, pure water to your public is a good thing, says OASIS International, said to be the inventors of the modern-day drinking fountain and designers and manufacturers of clean drinking water systems. Keeping it going can be hard, though, notes the company — if you don’t keep filters up-to-date, a lot of the purity you’re seeking can literally go down the drain. 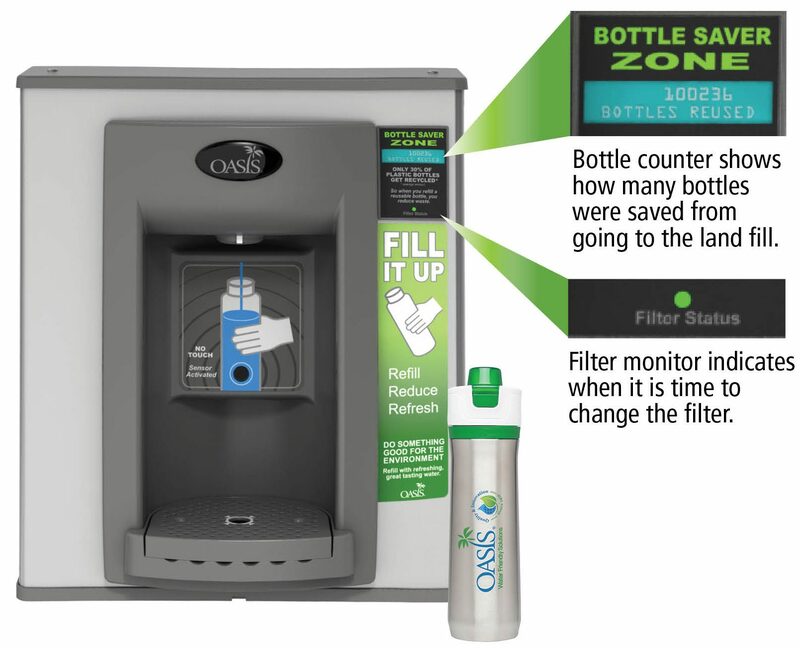 OASIS International makes it easy to know precisely when it’s time to change the filter with its line of Aqua Pointe and VersaFiller Sports Bottle Fillers. An easy-to-read filter monitor is built in to every unit, readily visible from the front. When the light is green, the filter is operating properly. When the light turns red, it’s time to change the filter. Filters are easily accessible for fast and easy changing, and an automatic shut-off inside the filter eliminates the need to locate the water valve. Durably constructed, OASIS VersaFilter is designed to last 1,250 gallons or approximately six months. VersaFilter is designed to provide high-level performance and flexibility, improving the taste of water while reducing odor, lead, chlorine, cysts, and other contaminants and particulates. It is tested and certified by NSF International to comply with NSF42 and 53 standards. Aqua Pointe and VersaFiller Sports Bottle Fillers are also available with other attractive features like hands-free activation, high-efficiency cooling systems, and exclusive FRESHIELD silver-based antimicrobial compound to reduce growth of microorganisms and mildew. For more information about the VersaFilter, visit the OASIS International website. The company provides bottle fillers, water coolers, bottle-less coolers, under-counter chillers, dehumidifiers, and numerous environmentally friendly products.